Learn to Program by Making Cool Games! No Starch Press, 9781593274092, 157pp. In Super Scratch Programming Adventure , kids learn programming fundamentals as they make their very own playable video games. They'll create projects inspired by classic arcade games that can be programmed (and played ) in an afternoon. The book's patient, step-by-step explanations of the code and fun programming challenges will have kids creating their own games in no time. This full-color comic book makes programming concepts like flow control, subroutines, and data types effortless to absorb. 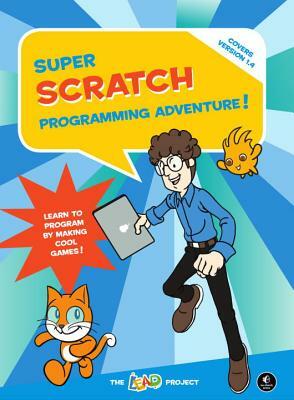 Packed with ideas for games that kids will be proud to show off, Super Scratch Programming Adventure is the perfect first step for the budding programmer.